This image shows 2 canvasses that I've recently prepared. I'm thinking about painting some aerial views of local towns - I like the thought of this different perspective on a place. Watch this space - I'll keep you posted as I get started! 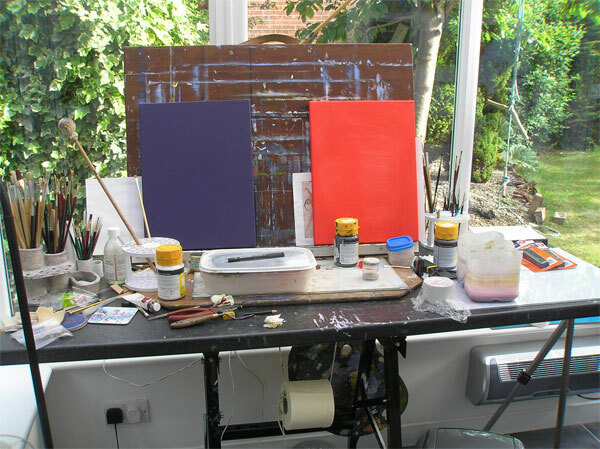 The red and purple canvasses are painted like this so that when I paint over them some of this colour will show through. I used a similar technique when I painted Walking the Dog, Holy Island, The Viking, Chicago Streets, Spooky Business and Scarborough Lighthouse. Have you ever thought of commissioning a painting? It's simple, just get in touch, and you'll have a painting that's perfect for you! I always start my paintings with a sketch or two; this helps me sort out the composition early on. It also helps me become visually familiar with what I’m going to paint; to learn what the object looks like. Try to think of the colours you will use and try them out on your sketch. How do the colours look when placed next to each other? You might like to pick complementary colours for a vibrant look, or colours that lie next to each other, on the colour wheel, for a more harmonious painting. Think about where to place objects. Objects on the top right-hand of the picture carry more weight than those on the bottom left. Don’t make the picture too symmetrical, and avoid placing objects squarely in the middle. Instead, place things off centre and lower down in the picture frame for a more stable composition if that’s what you want. Try this for yourself; cut an object out of a magazine and move it around a piece of paper. Where do you think it looks best? Remember you’re the final judge. Exploit the scale of an object to give a sense of depth. Make similar objects smaller if they’re in the distance and larger if in the foreground. If your painting has a path or a road, make it converge towards a point on the horizon (called a vanishing point). This really draws the eye into a picture and creates a sense of depth. Add blue to the colour of distant objects. Think about the shape of the object you’re going to paint. This is defined by the way the light plays on the surface. You’ll need to decide where the light is coming from, and be consistent for each object. Most objects require at least three different shades of the same colour to achieve a 3D appearance. I premix the colour before I paint an object, and then blend them on the canvas where they meet. Use a dry clean brush for this. An object might pick up some of the colour of a nearby object; from it’s reflected light. This is especially true of white objects, like snow, which has blue shadows (not grey!). A useful trick is to view the picture's reflection in a mirror. Strangely, this is like viewing the picture for the first time. Mistakes leap out at you! You can turn the picture upside down and get the same result! I hope you found these planning tips useful. Planning stops you making basic mistakes with colour and composition. You can always let the picture evolve as you paint it, so don’t let the planning stage stifle spontaneity. Perhaps the best advice I can give is that you should get painting, and keep painting. If you’re new to painting, you’ll need time to learn how to handle the medium, whether it’s oils, acrylics or watercolours. I’ve seen very competent watercolour painters produce poor results in oils, and vice versa. This shows that technique, as well as talent, is important so don’t give up too soon!